If Pp had not borrowed my car to take the Shop on the Borderlands to the Plymouth War-games show, I might have taken an Excursion, but as it was I just went out for a wander down the valley to admire the mist. The snowdrops are almost out, but they're looking a little draggled. But the mist and sky were beautiful. A buzzard went over my head just after I took this; quite a pale-coloured one, looking very impressive with its big square wings, but I didn't have the right lens on to photograph it. We were barked at by this lifeboat-supporting dog. I took its photo, thinking that I would take a photo of it barking, but of course it immediately shut up when I pointed the camera at it. Maybe I will try this tactic on other barky dogs and see if it shuts them up too. 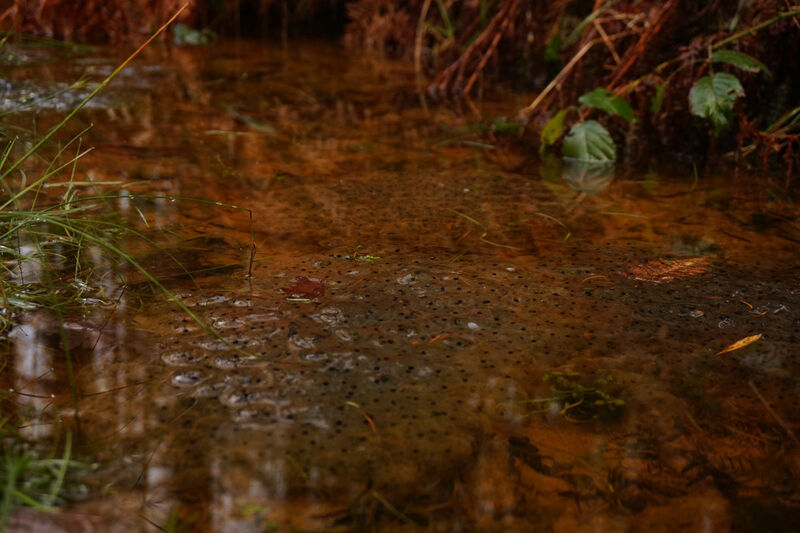 There's frogspawn in the puddles in the wood. It will be lucky if it doesn't get frosted though. The woods were full of alarmed pheasants, squawking and flapping. No deer, thank goodness, although I think Rosie was on the track of a fox, I didn't see him myself. I'm glad I saw the frogspawn though. There are daffodils in bud in the lanes already, and I met a lady who was making extravagant claims about primroses, though I didn't see them myself. Apart from that I got little done today apart from a certain amount of cleaning, as I was a bit tired, and ended up doing a lot of vacant internet-clicking, and not the drawing that I had intended. Rosie didn't sleep well, and demanded to go outside with an upset stomach, and then the cats saw at me and began screaming about breakfast, then Pp got up, and a short while later, Brythen came in and began flapping his enormous ears like a ridiculous flappy percussion instrument and in the end I gave up and got up. I intend to go to bed early tonight though, I haven't been sleeping well recently, which is most unlike me. I did a small painting yesterday, inspired by the Portrait Artist of the Year program on Sky. As usual, it looked kind of OK in pencil and fell apart spectacularly when I gave it some colour - so spectacularly that I'm not even going to photograph it and inflict it on this blog. I may try to re-paint it, possibly, and see if I can get it slightly less wrong next time. 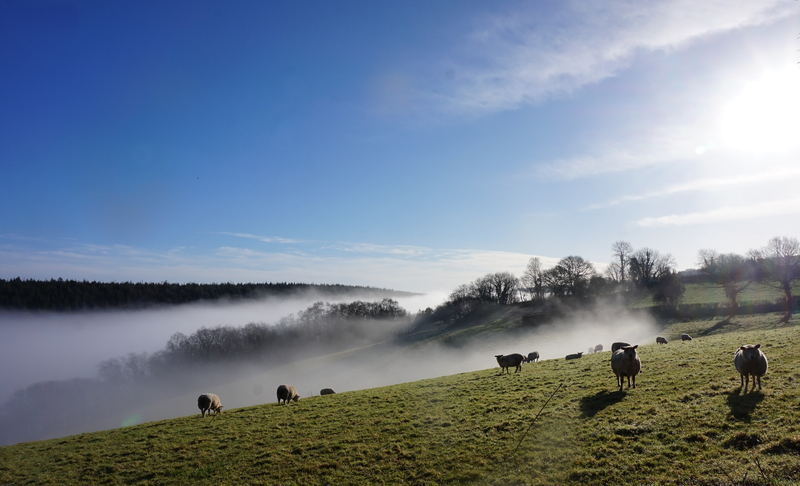 The fog, the sheep, the hillside, and the sheep dog make an incredible composition. Stunning. It reminds me of Erendis and Ancalimë living amongst the rolling hills, green grass, and sheep in Emerië. 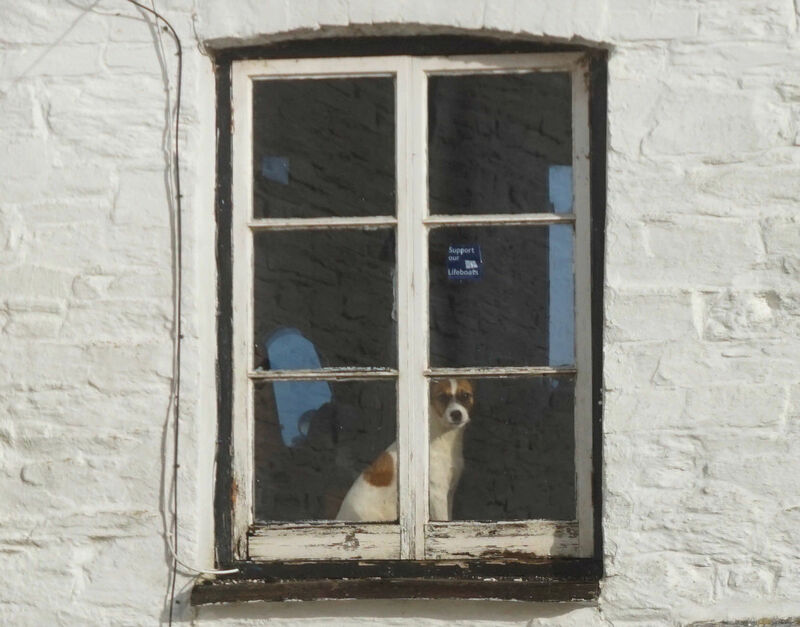 The dog in window is wonderful also. My eyesight isn't good enough to fully appreciate the last one. The fog in the morning definitely makes for an other-worldly feeling. By the time I came past on my way home again with the sun high it all looked much more prosaic. Frogspawn! It must be spring, if the frogs say so! Wonderful pictures - especially the terrier in the window.